Not a single clipper from the 1930s and 1940s has found a way to a museum or collection. Considering their impact in the history of air travel alone this fact is tragic. 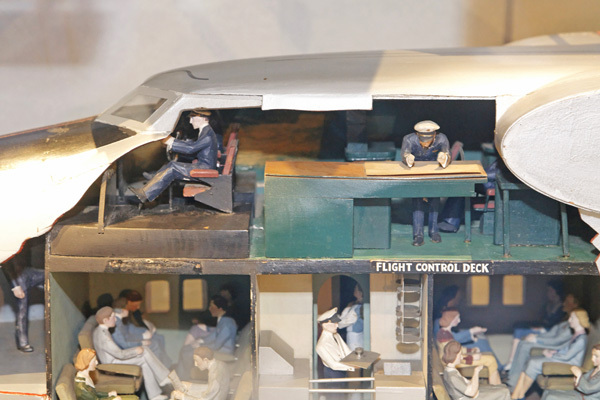 But museums have filled in this gap with models and several excellent books are in print for us to view. Night Over Water — by Ken Follett (a novel with good descriptions of the Boaing 314 and life aboard during a flight). Although we cannot take a flight on a clipper, or see one for ourselves, we do have a few options. 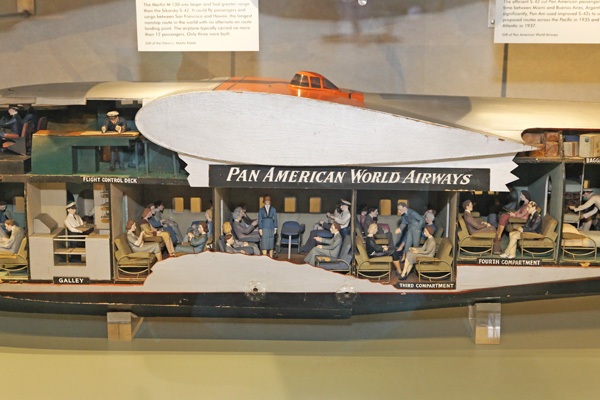 There are a few models of clippers with clear panels for viewing and the Foynes Flying Boat Museum has a full-scale replica of the Boeing 314 Yankee Clipper. 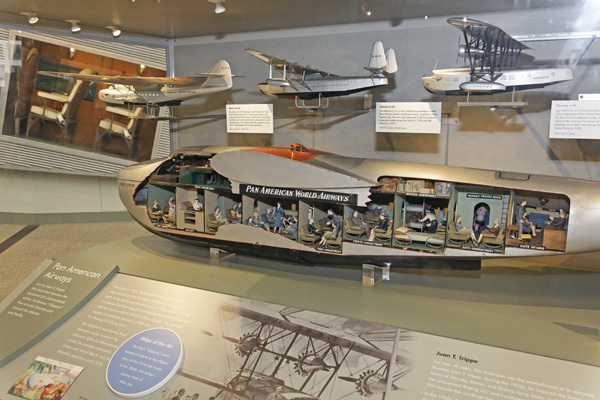 This is a museum to see, walking into a life-sized replica fuselage of a Boeing 314 must be experienced to be believed. 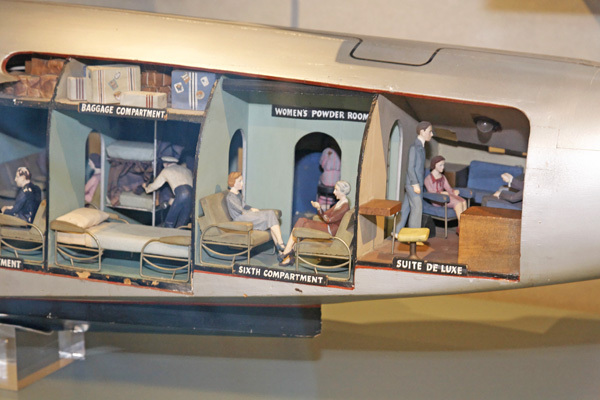 Communicating with David Brown, a director at the museum, indicates that all compartments are there to be walked through and viewed with the exception of the rearmost — the Suite de Luxe, also know as the “Honeymoon Suite” — though it can be easily viewed, just not entered. Today’s air travel is affordable and fairly comfortable. One can do a bit of a walk when on a wide body airliner, the food is good and the travel is quicker — often faster than the wait times in the departing airport it seems to me. But what would it be like to walk to different compartments during a flight? One for having drinks and socializing but then another for dining? Wouldn’t that be nice! What would that feel like? 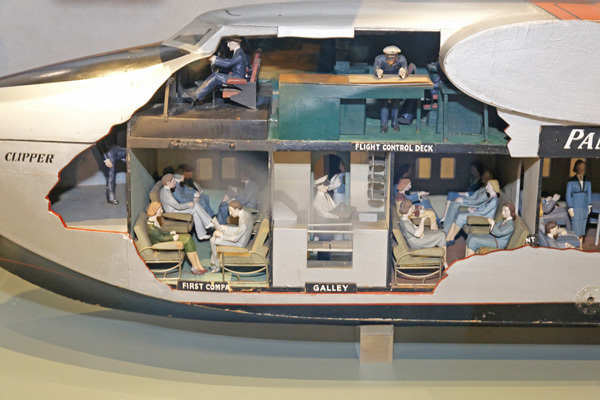 One can experience a bit of it at Foynes’s Flying Boat Museum … a rare and wonderful experience. It’s hard to believe that not a single clipper was preserved. That seems like an enormous oversight. Every aircraft has its own “fan” club and the clipper should have had a fairly large one. And it would be interesting experience to sit in seats facing to the rear, particularly in today’s modern jets. When flight attendants use rear-facing jump seats they use dual shoulder straps. All other regular seating simply provides lap belts which would prove inadequate for g-forces operating in the opposite direction. Several excellent points. I suppose jump seats are located where there is available space but I agree with you in that they usually face to the rear … better for sudden decelerations as the seat absorbs load instead of the body. I hadn’t thought much about the shoulder belts but you are right again … better than the passengers. Do you suppose it’s an FAA requirement of some sort? youtube views via lots of reasonably priced expert services. As a young sailor during WWII, I helped service the clipper at Port Loyettey, French Morrocco for a period of almost two years. The stop was around 2 AM, but we all stayed awake to see the pretty stewardes. The passengers went to a delicious dinner located in a Quonset hut there on base. One night the flight did not show and we some dozen sailors were invited ashore for a super nice duck dinner. As a writer and former PAN AM employee, I’d be interested in interviewing you about your two years servicing the Clippers. I’ll see if I can help you both get in touch. Let me see if this Forum enables my posting a photo circa-1950 showing one (-of four to six i saw there as a lad) Boeing 314’s unceremoniously ‘beached’ along SanDiego Harbor-drive; –later all the majestic-airships were ordered scraped by ‘dumb-democrat’ City-mayor.. “because he was tired seeing them abandoned there”! (hummmm, -i’m not seeing any photo-upload enabler; -but my e-mail is… [ robair1@att.net ], -will convey photo to anyone for posting here somehow!